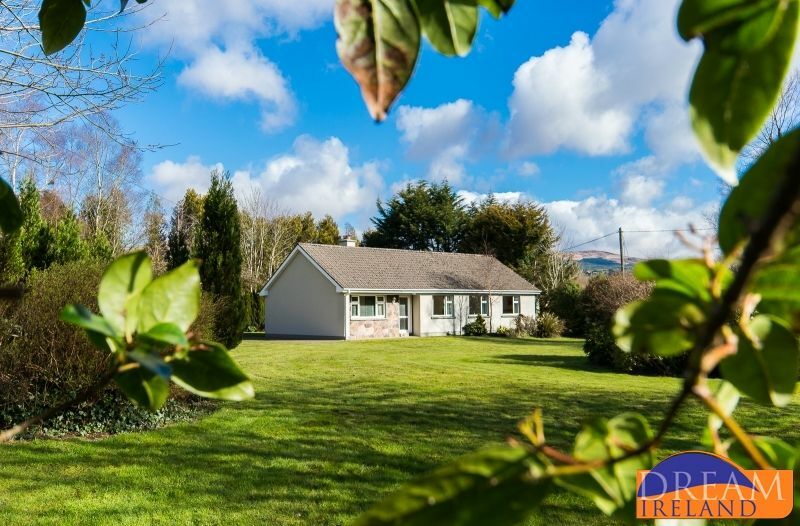 Located just a 5-minute drive (2kms) from the popular tourist town of Kenmare by the sea, “Teach Cleady” is a comfortable homely bungalow located on a ¾ acre of private land with mature landscaped gardens offering beautiful country views of the mountains beyond. This is a warm and welcoming home with lots of thoughtful finishes. The living room, dining room and kitchen are all open plan and offer country views and there is an electric fire for extra comfort on those cooler summer evenings. There is plenty of space for parking for guests with cars. WIFI is provided to guests free of charge during their stay. There are four bedrooms which can comfortably sleep 7 people. The master double bedroom which has a king size bed and an en-suite bathroom with electric shower is set at the front of the house and offers wonderful country views. Two further bedrooms also located to the front of the bungalow with double beds have access to the spacious main bathroom with a bath and electric shower. The fourth bedroom with a single bed is situated to the rear of the bungalow and has separate access to the master bedroom’s en-suite. OPEN PLAN KITCHEN, LIVING & DINING – Fully Equipped Kitchen with Painted Wood Ash Fitted Cupboards; Living Area with a 3 seater & 2 seater leather couch, TV & DVD Player and Dining Area with a large Dining Table which can seat up to 8 people. Kenmare is known as the jewel in the Ring of Kerry and no wonder with its location between two of the most beautiful touring routes in Europe - the Ring of Kerry and the Ring of Beara. These make for very enjoyable day trips from Kenmare. Kenmare has an abundance of shops, restaurants and pubs. Killarney is a 40-minute drive and Cork City is just over an hour's drive. The town of Kenmare is a mecca for some of the finest restaurants in Ireland. You really will be spoilt for choice when it comes to dining out with options to suit all tastes and budgets, from bar food to seafood and a range of other types of excellent restaurants to experience. The nightlife in Kenmare suits all ages and the hospitality with which you will be greeted is second to none. There is a great selection of pubs and late night bars to choose from with many featuring live music from traditional Irish to rock and modern styles. Kenmare lies approximately 30 minutes’ drive from a host of sandy beaches and it has a very pretty harbour within a few minutes’ walk from the town from where you can swim, fish or take a trip on the "Seafari Cruise" to view the wildlife in the area. Kenmare is home to the wonderful Star Sailing & Adventure Centre situated on the shores of Kenmare Bay and surrounded by the Caha Mountains just a five-minute drive from Kenmare Town Centre. The range of activities includes Sailing, Kayaking, Sea Kayaking, Windsurfing, Hillwalking, Boat Trips and much more. There is something to suit all the family. Kenmare and its vicinity offers some incredible dive spots and wrecks. You may even be lucky enough to come across a dolphin or two. Try-dives are available for beginners and advanced dives for the more experienced. For more information, visit Kenmare Bay Diving. Went down to Kenmare as my Mother is from Bantry and although it was quite a drive, it was well worth it! Kenmare is a beautiful location and there are so many great restaurants in the town. The bungalow is in a great spot just outside of town. The place has all you need to be able to cook all your own meals and the bedrooms are all very comfortable. Brian is great and willing to help in any way. All in all we had a wonderful time at Teach Cleady and would definitely return. If you eat out in Kenmare, you must try 'The Muse', absolutely glorious food! Our stay at Teach Cleady was the best. It met all of our expectations and needs. Teach Cleady was the perfect place for our family of seven. It was very clean, very well appointed and very comfortable and roomy. Brian, the caretaker was very responsive to our needs and did a wonderful job of checking us in. We would love to come back. Thank you so much! Maison très agréable, idéalement située à la campagne et à proximité de Kenmare. Au cours de notre séjour d'une semaine, nous étions cinq adultes et nous avons apprécié le calme de la campagne, le confort de la literie et du linge de toilette de Teach Cleady. La cuisine est bien équipée, la salle à manger et le salon sont lumineux. Grâce à Brian nous avons trouvé la maison à notre arrivée car celle-ci n'est pas très bien indiquée sur la route. Il a bien assuré notre accueil et nous a fourni toutes les informations nécessaires pour un séjour réussi.Il s'est adapté à nos horaires lorsque nous avons quitté les lieux et tout s'est très bien passé. Merci à lui. Nous avons apprécié la petite ville de Kenmare et, à partir de là, nous avons réalisé le circuit des deux rings. Cela nous a pris une petite journée pour chacun d'entre eux en profitant d'un déjeuner au pub et de pauses régulières au hasard des sites magnifiques..
Brian, el encargado de entregarnos la casa, una persona muy atenta y amable.